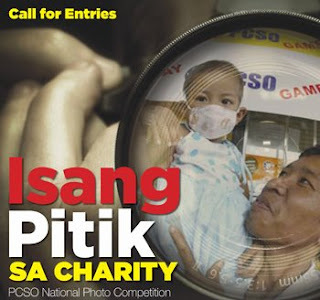 Isang Pitik sa Charity Photo Competition - PCSO ~ Philippine Freebies, Promos, Contests and MORE! Isang Pitik sa Charity is a photo competition revolves around the theme of "Peoples act of kindness." Both amateur and professional photographers are welcome to join this contest. Prizes go as high as P100,000 cash and as low as P5,000 for 12 consolation prizes. Not bad for a charity photo contest! Acquire a photo that depicts an act of KINDNESS DONE BY PEOPLE FROM ALLWALKS OF LIFE. Contest Period: Extended! until August 15, 2008 at 5:00 p.m.
"Photographer shall retain the copyright of his/her photos"